Directed by Hal Walker, starring Bob Hope, Bing Crosby and Dorothy Lamour, this is the sixth of seven “Road to…” movies that Bing and Bob made together, and the last one they would make before a 10 year layoff leading up to the disappointing final installment. None of the films are continuations of each other, and each begins with a new wacky premise that has the pair traveling to an exotic locale to joust over the affections of Dorothy Lamour. They’re also all splendid comedy classics which epitomize the comic tastes of the era and show modern day comedians how a well trained performer puts on a show. Crosby and Hope were among the biggest draws of the era, which was marked by the rise of comedy duos dominating the big screen. Crosby and Hope would go head to head with the likes of Laurel & Hardy, Martin & Lewis, and of course, Abbott & Costello at the box office during the 40s and 50s and Road to Bali also features cameos from Bing’s little brother, famous big bad leader, Bob Crosby, as well as stars of the era such as Dean Martin, Jane Russell, Jerry Lewis, and Carolyn Jones (most recognizable as the original Morticia Addams). As always, CMNYK is totally FREE and open to everyone. 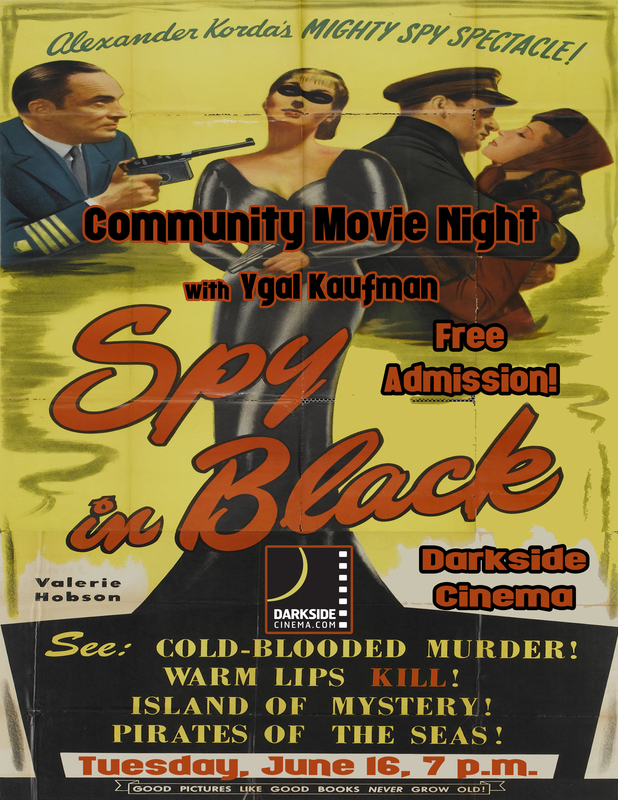 Donations are accepted and benefit the Darkside Cinema renovations. 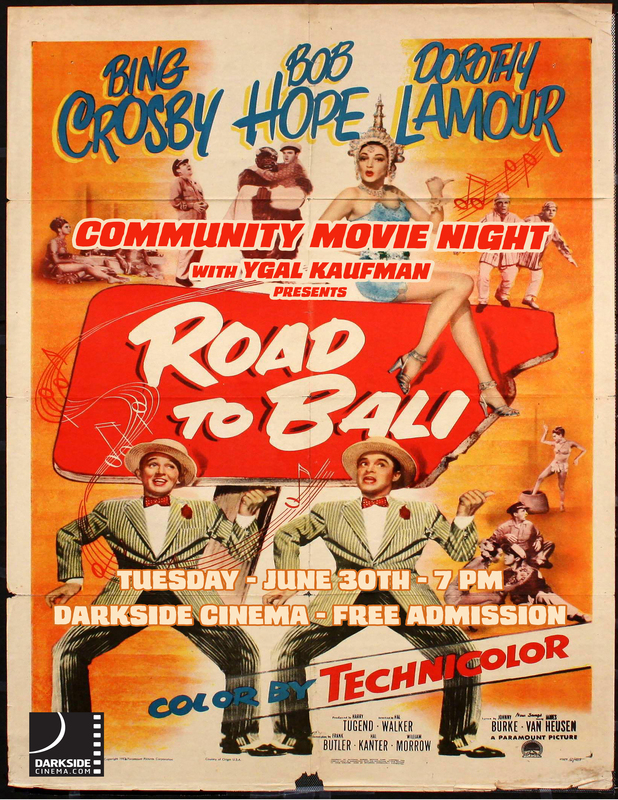 Road to Bali marks the 52nd Community Movie Night screening (54th if you count the Halloween double feature special), and there’s no end in sight. Join us for the one year anniversary celebration on July 7th featuring live music and other surprises. Thanks for keeping us going Corvallis! 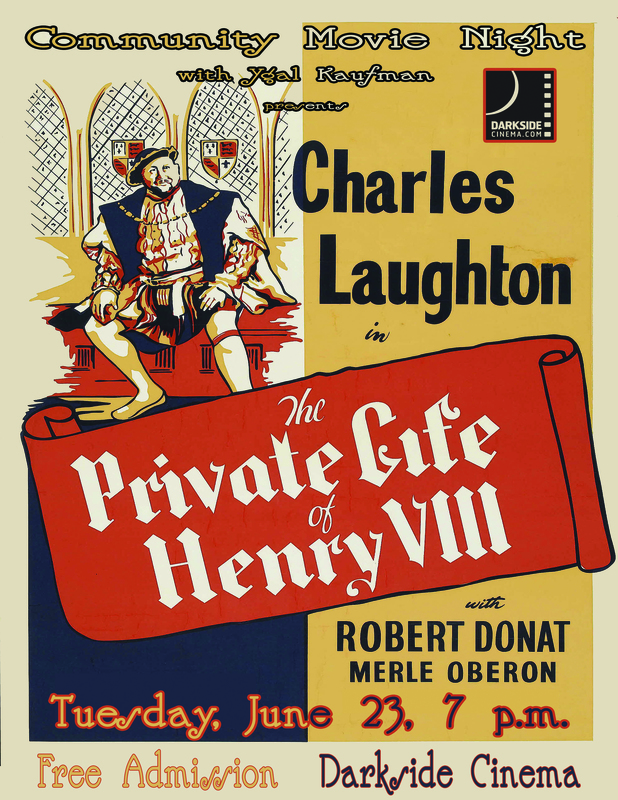 Next up for CMNYK is The Private Life of Henry VIII (1933) starring Charles Laughton, Robert Donat and Merle Oberon, directed by Alexander Korda. This is a very exciting event for us as we screen Korda’s brilliant masterpiece, starring one of the greatest casts of all time, headed by the inimitable Charles Laughton in his most legendary role. You’ve seen hunks like Eric Bana, Damian Lewis and Jonathan Rhys Meyers play Henry VIII, now see the best actor (not just in skill, but in appearance) to ever fill the role in this comic take on the life and loves of the famously fickle monarch. This is the first of several films we’ll be screening starring the masterful Laughton, and probably the best. This film also features appearances from Academy Award winner, and CMNYK alum, Robert Donat (The 39 Steps) as well as Merle Oberon as Anne Boleyn. Don’t miss it! Spy in Black (1939) starring Valerie Hobson, Conrad Veidt and Marius Goring, produced by Alexander Korda and Emeric Pressburger, directed by Michael Powell. This is the second Powell & Pressburger film to be screened at CMNYK (after 49th Parallel on April 21st), and we saved the best for… second. One of the finest wartime thrillers ever made, Spy in Black is the story of a German U-Boat in World War One spying off the coast of Scotland. Veidt, one of the greatest German actors of all time, is a powerhouse as the captain of the ship, and Sebastian Shaw makes an appearance as a disgraced Royal Navy Captain turned traitor (Shaw’s face is probably most recognizable as that of Darth Vader at the end of Return of the Jedi). Spy in Black (also known as U-Boat 29 upon its release) is also important as the first collaboration between Powell & Pressburger, one of the most prolific and decorated film making teams in history. They made 24 films together over the course of 33 years, including 49th Parallel (1941) and Black Narcissus (1947). This is one of the most exciting and unfortunately forgotten war time thrillers produced out of Britain during World War II and a great bit of acting, writing and masterful direction from one of the greatest film making teams of all time, under the watchful eye of the brilliant Alexander Korda. As always, the show is completely free to the public, so don’t miss it!